Home » Health » What Is Acute Respiratory Distress Syndrome? 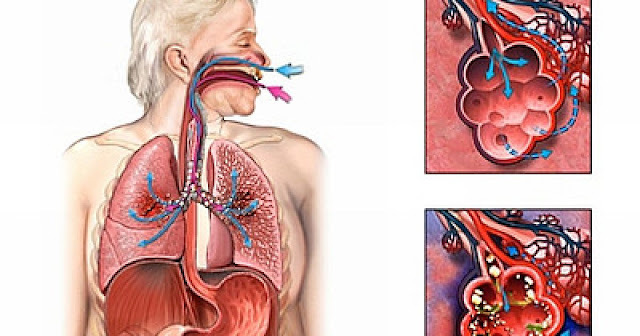 Acute Respiratory Distress Syndrome ( ARDS ) is a condition that occurs when fluid accumulates in the alveoli, the small air sacs and elastics in the lungs. Fluids usually seep from small blood vessels. This collection of fluids can make the lungs not enough air filled and the supply of oxygen to the bloodstream to be reduced. It causes organs, such as the kidneys and the brain, can not work normally or even stop functioning because it does not get enough oxygen. ARDS is usually experienced by people who have suffered critical illness or suffered severe injury. Most ARDS cause death, although there are also people who can recover completely. The magnitude of the risk of death depends on the age of the patient and the severity of ARDS. Shortness of breath and breathing frequency becomes rapid. A decrease in consciousness and feel very tired. Lips or nails are bluish in color. Inhalation of harmful substances, such as concentrated smoke or chemical vapors. Choking on vomit or near-drowning conditions. Injury to the head, chest, or other body parts. Overdose of sleeping pills or antidepressants. Receive blood transfusion with a lot of blood volume. Suffer from chronic lung disease. There is no specific inspection method for detecting ARDS. The diagnosis of patients suspected of ARDS is based on physical examination, chest X-rays, and blood gas analysis of the arteries to see the levels of oxygen in the blood. Blood tests can also be done to see the presence of anemia or infection. In addition to X-rays, doctors can perform a CT scan to diagnose ARDS. Electrocardiogram (EKG), to see electrical activity in the heart. Echocardiography, to detect disorders of the patient's structures and heart function. Giving oxygen. The doctor will raise the oxygen levels in the patient's bloodstream by providing additional oxygen through the nasal tube or mask. Breathing apparatus or ventilator . Ventilators help provide extra air pressure to the lungs of the patient. Adjust fluid intake. The doctor will regulate the amount of infusion fluids and nutrients that enter the patient's body, according to the results of clinical trials and the general state of the patient. Provision of drugs. Doctors will provide medications to prevent and treat infections, relieve pain and discomfort, prevent blood clots in the legs and lungs, and minimize acid reflux and gastric contents. If necessary, sleeping pills, especially for patients who use breathing apparatus. Lung rehabilitation. This action is needed to strengthen the respiratory system and increase lung capacity at recovery from ARDS. Blood clotting. Lying constantly can increase the risk of blood clots, especially in deep vein thrombosis . Lung collapse (pneumothorax). The use of ventilators serves to provide additional air pressure to increase oxygen flow in the blood. Ventilators also help clear fluids in the alveoli. However, ventilator use is risky to make small tears in the air sacs of the lungs, thus making the air in the lungs out through the small hole and cause the lungs to collapse. Infection. To connect the lungs with the engine (ventilator), inserted pipes or hoses into the throat up through the vocal cords. This hose is a foreign body for the body at risk of injuring and irritating the respiratory tract, and a place of bacterial growth. Pulmonary fibrosis. Pulmonary fibrosis causes the lungs to become inelastic and difficult to drain oxygen. Respiratory disorders (usually shortness of breath), to require additional oxygen upon return home. Impaired thinking power and memory due to the brain had shortage of oxygen supply. Muscle weakening due to lying too long and not used. Stopping smoking and avoiding cigarette smoke. Routine get a flu vaccine every year and pneumonia vaccine every five years to reduce the risk of lung infection. 0 Response to "What Is Acute Respiratory Distress Syndrome?"